This is something that I had been thinking about doing for a while now. Disclaimer: This comic is going to be done stream-of-consciousness style. One panel at a time, without any plan or roadmap. I do have an idea where I’d like to end up, but no definitive plan on how to get there. The story and the art is being done on the GO Train during my commute to my “Clark Kent” day job. The idea being that I’ve got to up my speed, and up my confidence in just getting these comics done. So that is the plan with this SPY GUY Webcomic. I don’t have a title yet for the story, and I’m not going to worry about it. I also am not sure how I will integrate it into ultraist.net but for now this journal is as good a place as any. Feel free to comment. Maybe it can even redirect the course of the story. This posting is a test of the automated e-mail blog posting system. The Direct Market is changing. Well, really, the whole comics market is changing, but I’m most concerned about the Direct Market portion of it. One of the problems is that a lot of the things that are changing are doing so relatively invisibly, and under the surface, so you’re probably not too aware of them, or how they’re affecting things. Hell, I’m not sure most of the time either, really! One of the things we take as an unwritten assumption in this market is that Diamond is basically the sole source for comics product. But even more then that, it’s because the books I find I am most interested in, are ones that just aren’t available through the Direct Market Channels. It seems that the Direct Market can’t see past it’s Super-hero™ glut. Don’t get me wrong, I like my Astonishing X-Men, and Ultimates 2, and Punisher MAX, and Batman and Savage Dragon, and Next Wave: Agents of H.A.T.E. I like it all just fine. But what I’d really like to complement it is Paper Biscuit, or a Bob G.O.M.P. Stuff that is all but being ignored (for lack of sales or lack of support) by the mainstream market. It’s possible that this stuff is supposed to exist on the fringe. That it’s not supposed to exist in the mainstream. I don’t know. But this is where the good stuff, the deep stuff, the new stuff exists. Created by an artist with a singular vision, and a burning urge to express that vision with the rest of the world. Compare that to the corporate mainstream, where creative decisions are made by non-creative executives. We’ve all seen the havoc that mentality has caused in comics during the Direct Market crash in the 90’s. And the mess that mentality made in animation, with Disney’s fall from grace, and the current CG glut we’ve gotten ourselves into. The best hope for entertainment is in the creation of creator owned and controlled properties. By artists that have a burning desire to create them. The arts are a part of our culture. If corporate culture dominates the mainstream with their empty candy coated fluff, who’s only purpose is to maximize the stock of rich corporate investors, then I think it’s time to start nurturing the counter-culture. I’m wondering if stores like The Labrynth, and Stuart Ng Books , and print on demand services like Lulu.com are going to be the next big thing in comic book culture. And awards like the Isotope Award For Excellence In Mini-Comics. This is where the next big things are brewing. Here is a stylized sketch I did 2 years ago while working at Tippett Studio on Hellboy: The Movie. I still like it. That was the title of a Yahoo! News article I saw the other day. I’ve gotta laugh when I read news articles like that. And I’ve been seeing them A LOT lately. I’d like to think of it all as some sort of a sign. Or a SIGN. But when I start to see patterns emerging I always think back to an article in the back of Cerebus #219. Off on a semi-tangent: Mark Mayerson wrote a good article on his blog about the state of animation in Canada titled Woe Canada. One of my biggest regrets is not pushing my drawing skills over my post-Sheridan years. Now I’m getting old(er). Time is moving faster. Whenever I look at stuff by artist at the top of their game (like in the links below) I get a reality check on just how far I am from the watermark I artistically aspire to, and I get a surge of energy to just try to get better. It’s hard work, but it’s work worth doing. Temple of the Seven Golden Camels – The art of storyboarding (and more). Walt Stanchfield – Drawing class notes from Walt Disney Studios. Chen Yi Chang – Animation Presentation (video). All I can really do is keep drawing. Keep pushing. Keep learning. This is something I should have done years ago. But life has a way of doing that, setting up distractions, veering things off course. My brother Blair has started a new feature over at Possum Press called Captain Smith and Broccoli Boy. You should check it out. Anyway, reading those strips got me thinking about a character I created back in high school. It was sort of like the futuristic counterpoint to Spy Guy. In my sketchbook I would alternate pages, so that it would be one page Spy Guy, next page Space A.C.E. Oh, and as for the name… I found out years later that an Animator named Don Bluth had created a video game in 1983 called Space Ace. That was like 5 years before I created my character. So in my own mind, to try and avoid any sort of trademark infringement, I would keep messing around with new names I could call the character. The closest thing I could come up with was Space Agents – with the lead character being called A.C.E. If I ever decide to do something with the character, we’ll see if I get sued. The point of all this type… after reading the latest installment of Captain Smith and Broccoli Boy I pulled out a sketch pad at work, and doodled this drawing. There you have him; Space Agent A.C.E. Sort of my answer to Mega Man, Astro Boy, Han Solo and Captain Kirk. His sidekick is the equivalent to a robot swiss army knife. Maybe they will appear if future doodles, perhaps even as future back up features in the Spy Guy comics. That is, assuming I don’t get sued. 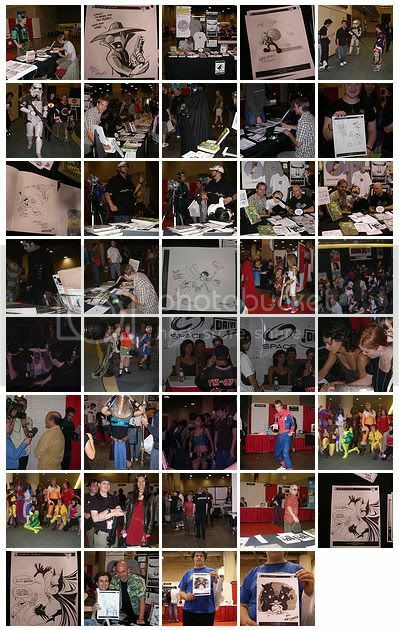 Following the aftermath of the Toronto Comic Book Expo 2006, some interesting articles and interviews have appeared. The following is a podcast interview conducted by Paul French in which he interviews a variety of people involved with independent comics and film, including my bro. Blair Kitchen as well as myself. Click the banner below to visit Poptopia. Another article, written by Steve Layton has appeared over at Heroic Arts Comics and features both Possum Press and Ultraist Studios. We appear in part 2 (of a 5 part series). Also included in the article are the sketches we drew for them at the convention. Mine is pictured below. Also, for more in depth coverage of the excitement that was the Toronto Comic Book Expo 2006, you can check out my brothers Possum Press blog for his exclusive coverage. Here is a pic my bro. 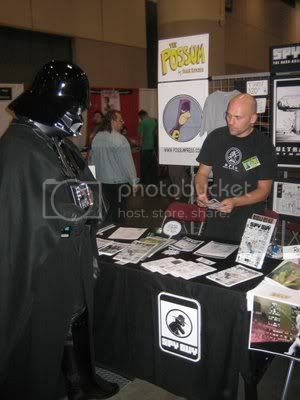 took of me selling the Spud & Harry preview comic to the Dark Lord Of The Sith himself. … oh, and if you have’t seen it already, click here for the comics I aquired from the show.